This product is no longer available and has been replaced by: SP90-L. 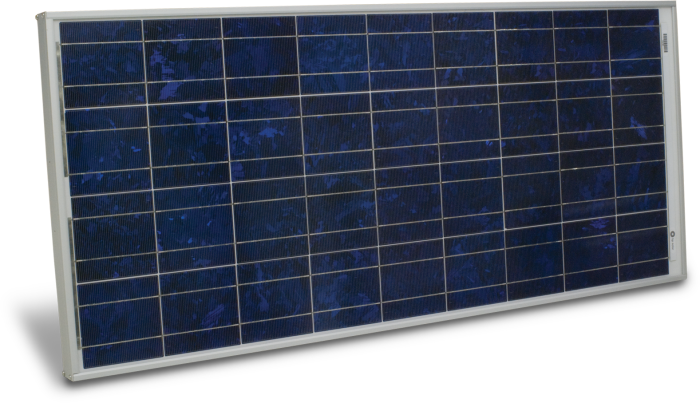 The SP85-L is a 85 W solar panel used in systems with large power requirements. It recharges 12 V flooded batteries. Its cable length is user-specified, and the SP85 allows unattended operation of systems in remote locations, far from ac electrical sources. The SP85's mounting hardware provides two sets of U-bolts and nuts. One set contains the pn 17492 U-bolt that provides a 2.125" (5.398 cm) space between the U-bolt legs. It is used to mount the solar panel to a 0.75" to 1.5" IPS pipe (1" to 2" OD). The other set contains the pn 17446 U-bolts and matching nuts. The 17446 is used to attach the solar panel to a tower's legs. The 17446 provides a 1.5" (3.8 cm) space between the U-bolt legs. One SP85 can be connected to the SOLAR charge input of the CH200 or 18529 SunSaver regulator to provide a peak charge of 85 W. Two SP85 solar panels can be wired in parallel to the charge inputs of the SunSaver 18529 regulator to provide a peak charge of 170 W.
One SP85 can be connected to the SOLAR charge input of the CH200 or SunSaver 18529 regulators to provide a peak charge of 85 W. Two SP85 solar panels can be wired in parallel to the charge inputs of the SunSaver 18529 to provide a peak charge of 170 W.